A collection of forty deep acting Flower, Gem & Crystal Essence combinations, each focused on a particular issue, pattern or state. These powerful Combinations help to facilitate an inner change & transformation that is gentle, effective and life enhancing. Divine harmony is a state of inner balance in which mind, emotions and spirit work together as an integrated whole. 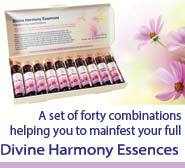 The Divine Harmony Essences provide you with the tools that can help you to restore the balance between mind, emotions & spirit, allowing you to manifest your own highest potential. The Being Present Essence... Use this Essence to help you stay fully present and focused in the now moment. The Emotional Balance Essence... Promotes the ability to stay emotionally calm and balanced. The Feeling Safe Essence... Dissolves the belief that ‘the world is not a safe place’. The Female Essence... Take this essence to help you embody your feminine qualities more fully. The Healing Abuse Essence... An excellent support for anyone working with issues related to abuse. The Healing Bereavement Essence... An excellent support for all situations of bereavement & loss. The Inner Certainty Essence... Helps to restore the core emotions of faith & trust. The Inner Focus Essence... Use this combination to help deepen your experience of meditation. The Inner Freedom Essence... Use this essence to help promote tolerance and personal freedom.